Product code: ES7402 Categories: Sold Items, Sold Rings. The history of poison rings goes back as far as Roman times and were allegedly used for poison to be secretly carried in a ring that was used to poison someone or even used to commit suicide when imminent capture was upon them, and here is a very stylish 18ct yellow gold cabochon amethyst poison ring that will always be such a talking point. Made in the 1880’s, this ring was so beautifully hand made with an incredible setting that by itself will always be admired. And then there is the large cabochon amethyst sitting proudly in the centre and hiding its ominous secret. 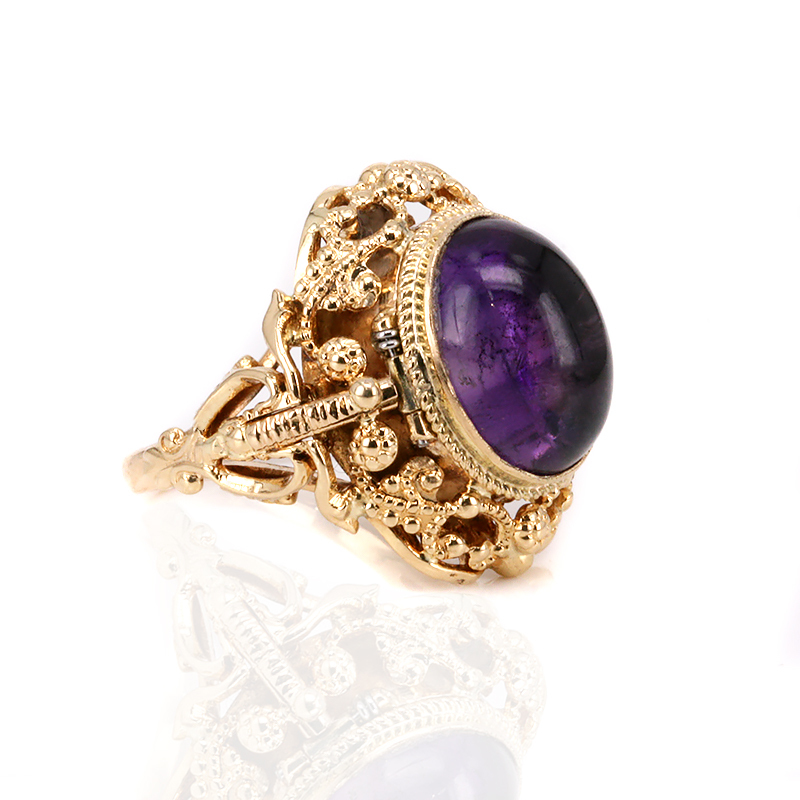 Upon lifting the amethyst from one side, the hinge opens to reveal a secret compartment. While this ring is not as old as ones from the Roman or even the 16th and 17th Century when they were also popular, it would be nice to think that this ring was designed more as a folly rather than for misgivings towards others. Measuring 21.4mm across by 22.2mm and sitting so proud on the finger, not only will this ring look amazing on the hand, but there is little doubt that this amethyst poison ring will always be such an incredible and interesting talking point and is most certainly very unique and special. The history of poison rings goes back as far as Roman times and were allegedly used for poison to be secretly carried in a ring that was used to poison someone or even used to commit suicide when imminent capture was upon them. Also found in rings from the 16th and 17th Century, antique poison rings are as rare as they are incredible to learn about. 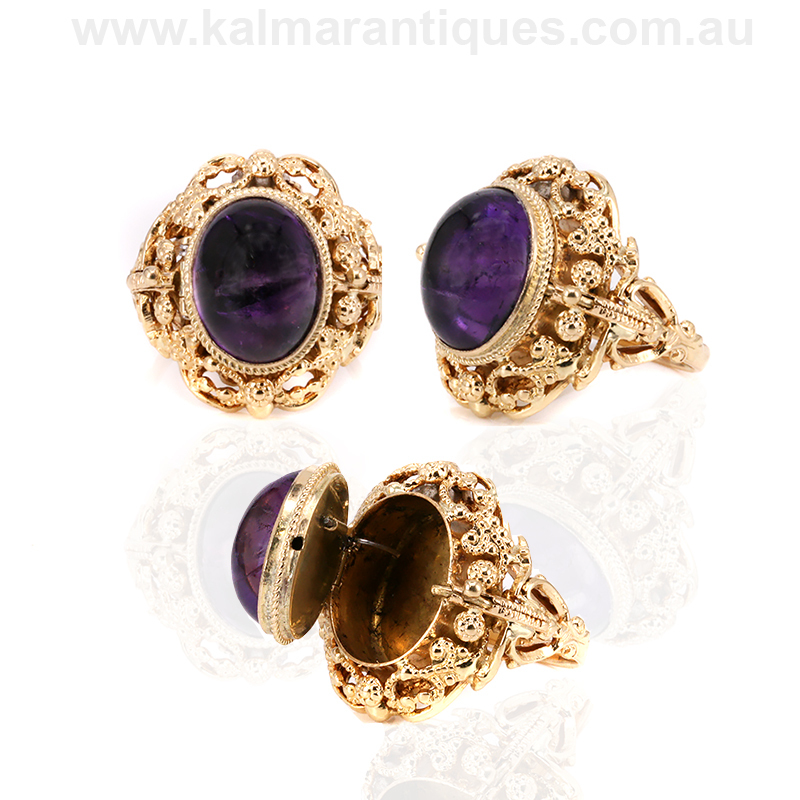 Kalmar Antiques, the best antique shop in Sydney.